← Why Collectors Collect: R.T Gwynn. Writing recipes for a living really is as much fun as most people probably imagine it to be. On the whole I have always been lucky enough to love my work with all its variety and challenges; over the years I’ve cooked most things, from a step-by-step haggis feature for Good Housekeeping Magazine at the end of the 70’s (yes really!) to baking a harvest wheatsheaf whilst on Woman and Home to recreating a Swedish Christmas celebration for a Waitrose publication – the wonderful Seasons – over a decade ago. These days I’m still fortunate enough to get to work on fascinating and rewarding projects such as the completely marvelous WI Centenary cookery book, the manuscript of which I have just delivered (due out in March 2015). It has been so much more than just another cookery book, as I’ve explored the social history of the last 100 years from the starting point of recipes. It’s been extraordinary and I’ve loved every minute of doing it. And I am now starting to come back to normal life now it’s finally with the publisher – and getting back to my poor neglected blog! I’m also writing regularly for Waitrose, as I have done over last five years, following on from ten years working as a consultant editor for their lovely publications team. Occasionally I come up with a collection of recipes that really stand out as special – one such set has appeared in the latest edition of their Harvest magazine – the early summer issue in store now. Everyone has raved about these particular recipes so I thought I’d put them up here for anyone who missed them. 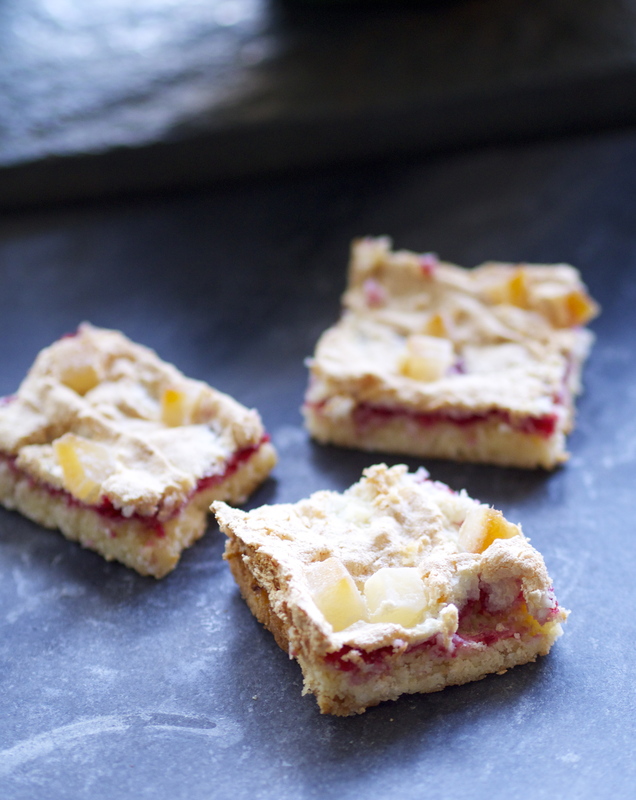 The coconut squares with their fresh raspberry jam filling were quite wonderful as was the raspberry chocolate biscuit cake, made with honeycomb crunchy pieces in it. As you will see, I made full use of the very good Cook’s Ingredients range from Waitrose – it’s perfect for bakers and keeps getting better. 1 Preheat the oven to 180C gas mark 4. Butter a 30 x 20 cm oblong shallow cake tin. Place the raspberries in a small pan with the granulated sugar and heat gently until the sugar dissolves. Simmer for 5 minutes until thick and syrupy. Cool. 2 Beat together the butter with 100g of the sugar until pale and creamy. Beat in the egg yolks one at a time then stir in the ground rice and 100g of the coconut to make a firm dough. Press this mixture into the tin. Spread with the raspberry jam mixture. 3 Whisk the egg whites until stiff then whisk in the remaining sugar until the mixture is stiff and glossy. Fold in the remaining coconut and spread this mixture over the raspberries to cover. Scatter with the coconut chunks and bake for 25 – 30 minutes until the topping is golden and lightly crisp. Cool in the tin and then cut into slices and store in an airtight container. 1 Preheat the oven to 170C Gas mark 3. Butter and base line a 20cm deep round cake tin. Cream the butter with the sugar and lemon rind in a large mixing bowl until very pale and light. Gradually beat in the eggs a tablespoon at a time, adding a tablespoon of sifted flour if the mixture starts to split. 2 Fold in the sifted flour with the lemon juice, soured cream and caraway seeds. Spoon into the prepared tin and level the surface making a shallow well in the centre with the back of a spoon. Scatter over the blueberries evenly. 3 Bake for about an hour until the cake is well risen and golden and a skewer emerges from the centre clean and dry. Cool in the tin standing on a cooling rack. Remove from the tin when cold and store in an airtight container. l Preheat the oven to 180C gas mark 4. Butter and base line a 20cm square cake tin. Sift the flour and baking powder into a mixing bowl and add the sugar, butter, eggs, pepper and freeze dried strawberries. Beat with an electric mixer until well combined and of a soft dropping consistency. Spoon into the prepared tin, level the surface and make a shallow hollow in the centre with a spoon. 2 Bake for about 35 minutes until the cake is golden and firm to the touch. Turn onto a wire rack to cool completely. To decorate, whip the cream with the icing sugar until it forms thick peaks. Stir in the chopped strawberries. Cut the cake half horizontally and sandwich together with the strawberry cream. Turn upside down. 3 Warm the redcurrant jelly with a tablespoon of water until melted and brush over the cake. Roll out the fondant icing thinly and use to cover the top of the cake. Cut into sixteen squares and top with rose petals. Chill until ready to serve. This one got the thumbs up from my yoga group who have all been begging for the recipe. It definitely improves with keeping so store in the fridge for at least a day before you eat it if you can bear to. We all thought it would make a lovely summer dessert with ice cream. 1 Place the biscuits in a freezer bag and roll with a rolling pin to crush finely. Mix with the icing sugar in a large bowl. Melt the plain chocolate with the butter over a gentle heat then add to the biscuits with 50g honeycomb and mix thoroughly. Press firmly into a buttered 20 x 26 cm Swiss roll tin. Chill for 15 minutes until set. 2 Melt the milk chocolate in a basin set over a pan of simmering water. Don’t let the basin touch the water. 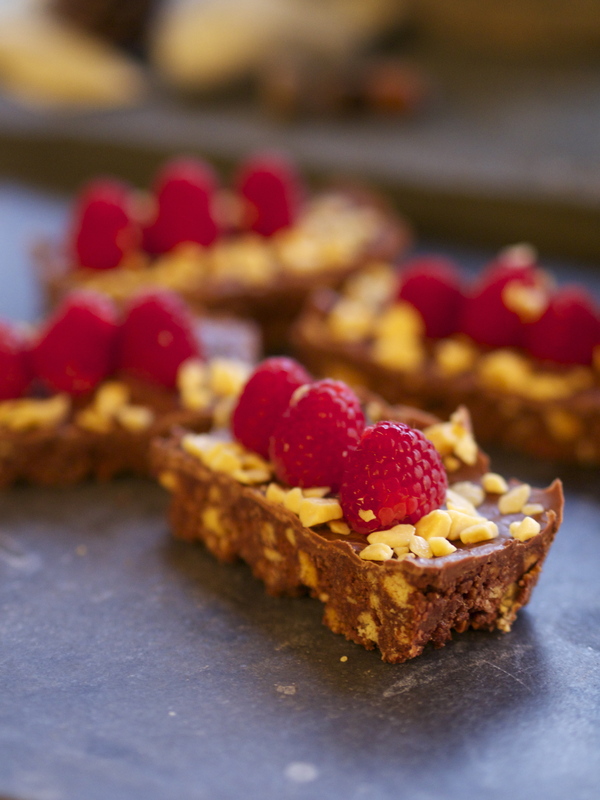 Spread over the biscuit base and arrange the raspberries over the surface stalk ends into the melted chocolate. Scatter with the remaining honeycomb. 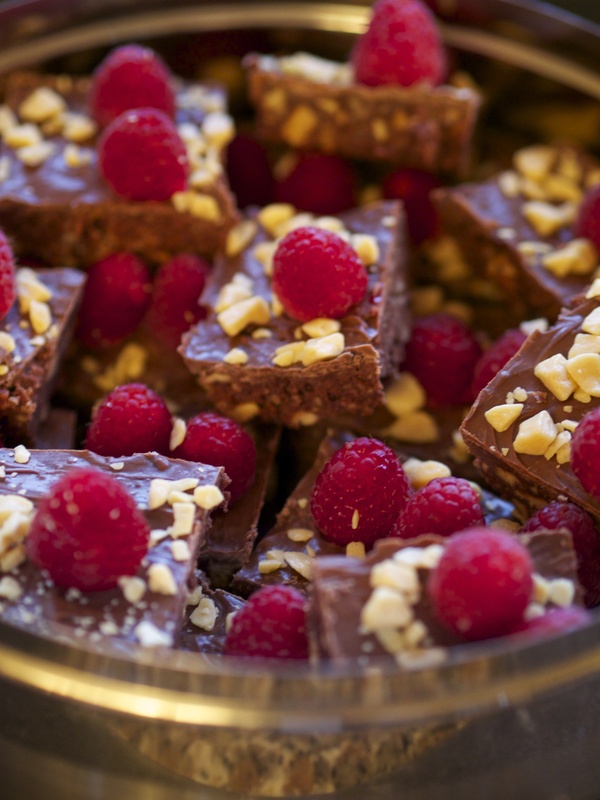 Chill until the chocolate has set then cut into squares. 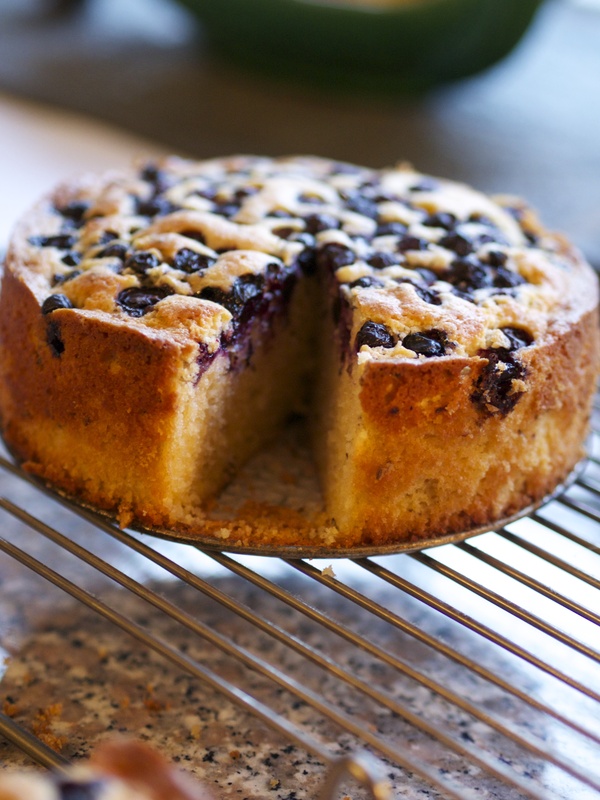 This cake improves with keeping for a day as the flavous meld together. This entry was posted in In season, Recipes and tagged baking, chocolate biscuit cake, chocolate honeycomb cake, mary gwynn recipes, Raspberry recipes, strawberry recipes, summer fruit recipes, tea time baking, waitrose recipes. Bookmark the permalink. Thanks – they really are as good as they look, specially the chocolate biscuit cake! 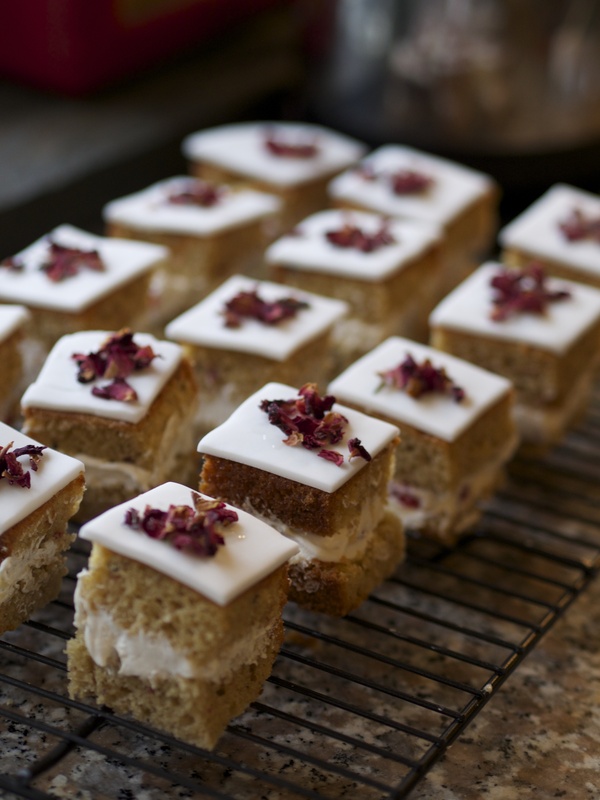 Perfect for the bank holiday so will be making them today!